Laek House makes casual clothing inspired by cycling’s rich history and the realities of urban riding; like getting doored, brushed by a pink-haired-lady on her way to Bingo, and f’ing SUVs. Visibility drove Laek to develop ELVS, a retro-reflective ink that appears grey in ambient light but blasts bright white in focused light. Nice, but wearing a super-reflecto hat doesn’t show too much under a helmet, so Laek also offers a limited edition black ELVS Deep-V.
That’s Kevin “Squid” Bolger testing the wheels. 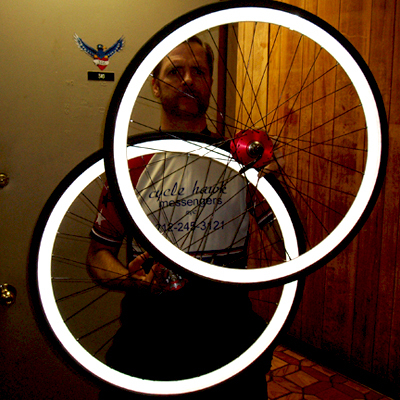 And while those ain’t as splashy as these DIY sparkly wheels from SpokePOV, drivers are def going to see you at night.